The sequel of Mahou Shoujo Lyrical Nanoha is here; bigger and better than before. Now with more action, adventure and a proper story, Mahou Shoujo Lyrical Nanoha A's is a worthy successor to the anime series. I must say that this series jumped straight into the action in the first few episodes- which is a good thing. The story starts off where the prequel left off with Fate finally being released from detention and is reunited with Nanoha in the worst way possible. As you may have guessed, Nanoha is attacked by a powerful mage with their own goals of collecting power from other mages. 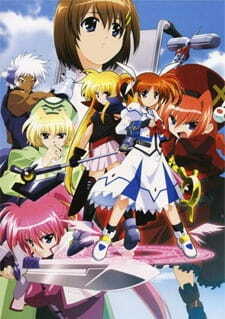 Once again it is up to Nanoha and her team to stop the renegade mage from hurting anyone or anything else. Much similar to the prequel, we see a huge conflict and misunderstanding between the mages as they fight for their own goals. Of course everyone is happy in the end, but this story is quite worth the watch as the battles are more aggressive and well planned. It was nice to see that the series has taken off from a "childish" start to a more "teenage" style approach that will interest teens which are into magical girls and super powers. The art style and animation has been dramatically improved in this series with more special attacks, better transformation sequences and a whole new location. Character detail was slightly improved with the addition of textures and shading in some scenes. The new costumes and weapons all looked stunning and were spectacular in the battles scenes. It was good that the transformation sequences were toned down a bit which was my main complaint in the prequel. The sound was rather decent with the opening and ending themes being your standard pop tunes. The voice acting was all but the same as the prequel. The new characters perfectly matched their voice actor counterpart. I must add though, I was quite amused and surprised that some weapons spoke German. That was quite interesting indeed. Moving on, the background music was rather reused a lot throughout the anime so there was no sense of invoked feelings from the music which was rather disappointing. The anime series starts off with Nanoha as a 13 year old again. Once again, I thought 13 year olds doing the impossible was quite fantastical indeed. However, bearing through the prequel made me come to accept the girls as being this young. Thank goodness though that the anime ends with Nanoha being 15 after the events of the final battle that occurs in the last episode of the series. I also noticed that one of the characters, Vita was exactly like Taiga in Toradora! (same voice actor). Same personality: tsundere. As for the other new characters, they were quite interesting and uniquely different. Overall, it was a enjoyable sequel to watch. The story has been improved, the visuals more spectacular, and the introduction of a few new characters made this that more entertaining to watch. Less repetitive action and more mysteries are abundant in Mahou Shoujo Lyrical Nanoha A's. If you are into magical girl anime then you definitely must watch this sequel. It is worth it. A much better story with less repetitive battles and more of an interesting plot. Improved battle animations and cute costumes! The theme songs were rather generic but the voice acting was improved. I liked the new characters more than the old ones. Entertaining to watch. The improvements are a welcome addition to the anime. Definitely improved from the sequel.